MGNREGA North & Middle Andaman Technical Assistant Recruitment 2018 – 2006 launched Mahatma Gandhi National Rural Employment Guarantee Act has again captured the headlines as there are total two vacancies of Technical Assistant in the north and middle Andaman region. Finally, Joint DPC, MGNREGA (senior accounts officer, DC’s Office/ north & middle Andaman) has undersigned and published the vacancy notice from the office of the district programme coordinator (Deputy Commissioner), MGNREGA, N&M Andaman, Mayabunder, applications are invited for the post of Technical Assistant purely on contract basis under Mahatma Gandhi National Rural Employment Guarantee Scheme in North and Middle Andaman District. Giving remuneration (consolidated) of Rupees 11,000/- under the Age Limit not above 40 years as on 10th October 2018 for Technical Assistant, notice is available online on an official website. Educational Qualifications and other criteria required or desirable are 1. Matriculation or its equivalent, two-year certificate course in the survey from a recognized institution. knowledge in the field of traversing and levelling AND one year experience in the concerned line respectively. 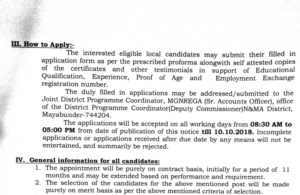 The interested eligible local candidates may submit their filled in application form as per the prescribed proforma along with self-attested copies of the certificates and other testimonials in support of educational qualification, experience, proof of age and employment exchange registration number. 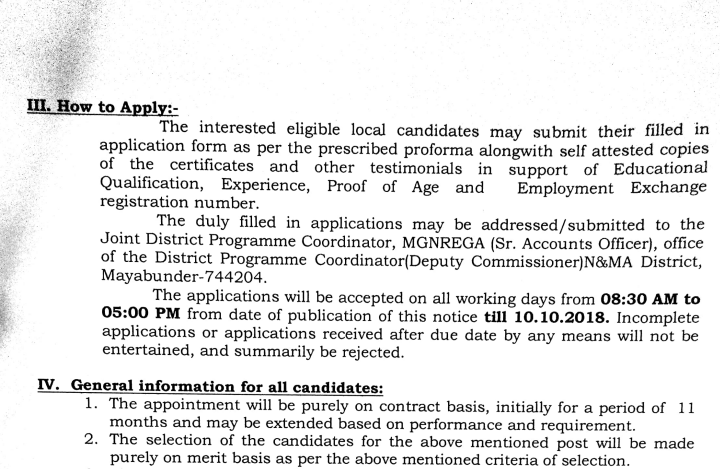 The duly filled in Applications may be addressed/ submitted to the Joint District Programme Coordinator, MGNREGA (Senior Accounts Officer), office of the District Programme Coordinator (Deputy Commissioner) N & MA District, Mayabunder – 744204. The applications will be accepted on all working days from 08:30 AM to 05:00 PM from the date of publication of this notice till 10th October 2018. Incomplete applications or applications received after due date by any means will not be entertained, and summarily be rejected.